I thoroughly enjoy reading your reviews and look forward to them. I have been a Fallkniven junkie for a while now and find them to be solid quality performers. I handed down my a1, s1, and f1 a while back after picking up the volcano and juni models. I’ve always found their vg10 laminated blades to perform admirably. Their 3g and laminated cobalt steel is phenomenal stuff. It’s worth the extra coin IMHO. I find fallkniven knives to be custom quality in production knives. I edc the juni all the time and find it is perfect for most tasks and most sheeple find it to be “cute”. The kolt is another awesome knife. If your in the market for a fixed edc have a gander at one of their smaller fixed blades with their super steel, you won’t be disappointed. Thanks for all your efforts with this site. PS still hoping for a hatchet/hawk REVIEW. Thank you for the kind comment and the thoughts on Fallkniven. I have really come to enjoy their knives, so I may venture into some of their high end offerings. My father has a W2 and he really likes it, so I am intrigued to try out a Kolt or Juni. I have no problem venturing into the worlds of hatchets and hawks… that aspect of my collection is severely lacking. I’ll see what I can do. Very nice write-up! I’ve used an F1 for years in a variety of “stern” backcountry conditions – most of it in the Boundary Waters region of northern MN. I don’t whack my knives into rock or dirt (that’s not how you treat a knife), but I do baton with the F1 on every trip. I’ve probably batonned hundreds of linear feet of wood (measured in 12”-18” chunks 😉 and I’ve never had the edge chip or roll, and never developed any play in the handle. Also, the spine is ground with a “crisp” corner to cast sparks on a firesteel – another nod to it’s utilitarian purpose. It’s a straightforward tool, and a darn good one. Thank you, Bryant! Good point about the sharp shoulder for fire steel – it definitely works for that. Yeah I have never had any issues with the VG-10 edge myself, but it doesn’t take much rooting around on the internet to find a wealth of controversy in the forums surrounding the selection of VG10. The F1 is a great little knife with alot of versatility. I take mine all the time when I go hunting and backpacking. I also made a kydex sheath for mine and Carry it as an EDC with the spyderco g clip. It’s a great knife and I think the more you use it the more you will like it. My pleasure, Nick. Thanks, I have had mine for a while now and I do enjoy it – although it hasn’t quite kicked my big blades out of the garage just yet. 😉 Thanks again. 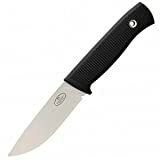 Dan: The F1 is one of those knives which can serve a function not contemplated by the design team, in this instance the Swedish Air Force committee that approved the knife. Suppose that you are urban, possibly even having to wear a decent suit. You want to carry a fixed blade knife, but not wear it on a hip in a sheath or in a leg sheath. This is one of the few knives with which a person can do the following. Keeping the knife in its plastic factory sheath, place in the unit within a front suit pants pocket. It can be comfortably carried thusly. How is it possible? Well, the knife was deliberately designed with a small handle because it was likely that a Swedish pilot would wear a pair of gloves if he bailed. I laughed at a youtube video that was critical of the knife’s handle. The video was shot in the woods in the middle of the summer and on a warm day. The guy complained that the handle/grip was too small! That is pretty cool! Yes, I think it’s important to keep the intended use in mind when examining any knife. Sometimes we ignore these nuances as we project our own biases onto a knife, but the truth may be that the knife was designed with an entirely different purpose in mind. Doesn’t make it a bad knife – but maybe not the best choice for the situation. I have a couple of f1’s and like them very much. It is definitely true that many users/reviewers seem to ignore the original purpose behind the design of a knife and sheath. The f1 was conceived to be a cold weather, all-purpose knife that is unlikely to fail under hard use. The handle size and make-up reflect the likelihood of use in cold weather. The thermo run is a very good insulator, and the svelte handle is not overly thick in a gloved hand. The zytel sheath still works if you soak, then freeze the knife in the sheath (good luck drawing your knife out of a kydex sheath under similar circumstances). The blade thickness and grind make the knife durable, the edge long-lasting and sturdy. The layered construction provides toughness and edge retention. All in all, the f1 and the as are both fabulously well designed for their intended purposes, and their thoughtful features and high grade materials and execution put them at the top of the production knife heap. They also demonstrate the Japanese ideal of “shibumi” (understated elegance) which accords well with the spare, Scandinavian esthetic.